Note: Questions are at the end of the post. I have read the other stackoverflow threads regarding Abstract Factory vs Factory Method. I understand the intent of each pattern. However, I am not clear on the definition. Factory Method defines an interface for creating an object, but lets subclasses decide which of those to instantiate. A factory method lets classes defer instantiation to subclasses. By contrast, an Abstract Factory provides an interface for creating families of related or dependent objects without specifying their concrete classes. The Abstract Factory looks very similar to the Factory Method. I have drawn a few UML classes to illustrate my point. The diagram are from www.yuml.com so they are not perfectly oriented. But its a free service :). The diagrams may not be perfect. I am still learning the GoF design patterns. If the Abstract Factory can have only one creator and one product, is the only difference between the Abstract Factory and the Factory Method that the creator for the former is an Interface and the creator for the latter is a Class? Hope this helps. It describes the various types of factories. I used Head First Design Patterns as my reference. I used yuml.me to diagram. Is a class with a Static Method to product various sub types of Product. Produces a Family of Types that are related. It is noticeably different than a Factory Method as it has more than one method of types it produces. (This is complicated refer to next diagram for better real-life example). DbFactoriesProvider is a Simple Factory as it has no sub-types. The DbFactoryProvider is an abstract factory as it can create various related database objects such as connection and command objects. The two patterns are certainly related! The difference between patterns is generally in intent. The intent of Factory Method is "Define an interface for creating an object, but let subclasses decide which class to instantiate. Factory Method lets a class defer instantiation to subclasses." The intent of Abstract Factory is "Provide an interface for creating families of related or dependent objects without specifying their concrete classes." Based purely on these intent statements (quoted from GoF), I would say that indeed Factory Method is in some sense a "degenerate" Abstract Factory with a family of one. They generally tend to differ in implementation, as Factory Method is a good deal simpler than Abstract Factory. AbstractFactory only declares an interface for creating products. It's up to ConcreteProduct subclasses to actually create them. The most common way to do this is to define a factory method for each product. This c2 wiki also has some interesting discussion on this topic. It seems that the OP's list of (excellent) questions has been ignored. Current answers merely offer rehashed definitions. So I will attempt to address the original questions concisely. No. An Abstract Factory must create more than one product to make a "family of related products". The canonical GoF example creates ScrollBar() and Window(). The advantage (and purpose) is that the Abstract Factory can enforce a common theme across its multiple products. First, we must note that neither Java nor C# existed when the GoF wrote their book. The GoF use of the term interface is unrelated to the interface types introduced by particular languages. Therefore, the concrete creator can be created from any API. The important point in the pattern is that the API consumes its own Factory Method, so an interface with only one method cannot be a Factory Method any more than it can be an Abstract Factory. This question is no longer valid, following the answers above; however, if you are left thinking that the only difference between Abstract Factory and Factory Method is the number of products created, consider how a client consumes each of these patterns. An Abstract Factory is typically injected into its client and invoked via composition/delegation. A Factory Method must be inherited. So it all comes back to the old composition vs. inheritance debate. But these answers have raised a fourth question! Since, an interface with only one method cannot be a Factory Method any more than it can be an Abstract Factory, what do we call a creational interface with only one method? If the method is static, it is commonly called a Static Factory. If the method is non-static, it is commonly called a Simple Factory. Neither of these is a GoF pattern, but in practice they are far more commonly used! In my opinion, the slight difference between the two patterns resides in the applicability, and so, as already said, in the Intent. Let's recap the definitions (both from Wikipedia). Both patterns allow to decouple the user objects from creating needed instances (run-time decoupling), and this is the common aspect. Both patterns allow to create a hierarchy of factories according to any specific needs, and this is another common aspect. Abstract Factory allows to create several different type of instances in one sub-class, and to particularize the creations behavior in its different sub-classes; normally, Factory method declares the creation of only one type of object that can be particularized according to the sub-classing mechanism. That's the difference. By summarizing. Let's say that Product defines the super-class of the creating objects, and that ProductA and ProductB are two different sub-classes. 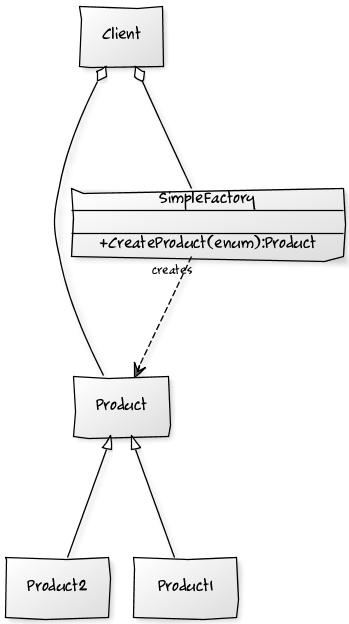 Therefore, the Abstract Factory method will have two methods, createProductA() and createProductB() which will be particularized (in terms of creation steps) in its specific sub-classes: the factory sub-classes particularize the creation steps for the two defined classes of objects under creation. According to the above example, the Factory Method will be implemented differently, abstracting the creation of ProductA and ProductB in as many factories (one method per Factory), and the further specialization of the creation steps will be delegated to the hierarchy as it is built. If I created an abstracted (referenced via an interface or abstract base class) Factory Class that creates objects that has only one method to create objects, then it would be a Factory Method. If the abstracted Factory had more than 1 method to create objects, then it would be an Abstract Factory. Let's say I make a Manager that will handle the needs of action methods for an MVC controller. If it had one method, say to create the engine objects that will be used to create view models, then it would be an factory method pattern. On the other hand if it had two methods: one to create view model engines, and another to create action model engines (or whatever you want to call the model that the action method contains consumers), then it would be an abstract factory. Although, it's been many years since people from StackOverflow questioned about this issue similarly in other posts (oldest goes to 2009), I still could not find the answer I wanted. The intention: coherence or "look-and-feel": Abstract Factory's intention is to group a family of objects with a same style (ex. same look-and-feel UI widgets, same style car parts, objects from a same OS, etc.) Many examples from Abstract Factory mentions about the key phrase "the same look-and-feel". Objects forming a bigger group object: Abstract Factory creates a family of objects forming a bigger group object, not a single object. Later add a new style: If we kept on using Factory Method and try to add a new set of style to existing infrastructure, it would be painful. With Abstract Factory, all we just have to do is simply create a new concrete factory that implements the abstract factory class. A car part for sports car used in a sedan. This inconsistency may lead to accidents. A Windows-style button in different OS GUI widgets. It's not going to break anything but hurt user experience for some people, like me. Later, we find out that our software needs to run in the next OS upgrade which needs different set of compatible system objects while keeping the software backward compatible. Therefore, when a final object group should have the same style without an exception of a object and you want to hide this "keeping the same style" detail, then we should use Abstract Factory. As far as I understand the meaning o Abstract factory and Factory method definitions the first one is implemented in static context and provides object based on input parameters. Second one uses already created object (the family) which implements factory method interface. The factory method then creates specific instance related to the original object no matter which one it is. So this usually leads to using both patterns together where in first step you create some general object which describes family of related objects. It is called by static method getInstance("my family name") method. Implementation of such getInstance method decides which family object will be created. Then I call createProduct() method on newly created family object and depending family object the new product will be returned. It seems that these patterns cooperate to each one. In another words Abstract Factory is focused on "WHAT" will be created and Factory method "HOW" it will be created. Mamalfactory, BirdFactory,Fishfactory,ReptileFactory. Now that you have a single factory from the AnimalSpeciesFactory, they use the factory pattern to create specific objexts. For example, imagine you got a ReptileFactory from this AnimalFactory, then you could offer to create reptile objects like: Snakes,turtles,lizards objects. Factory method pattern is a creational design pattern which deals with creating objects without showing the exact class of object that is being created. This design pattern basically allows a class to defers the instantiation to sub-classes. The Abstract Factory pattern serves encapsulation to a group of individual factories without exposing the concrete classes. 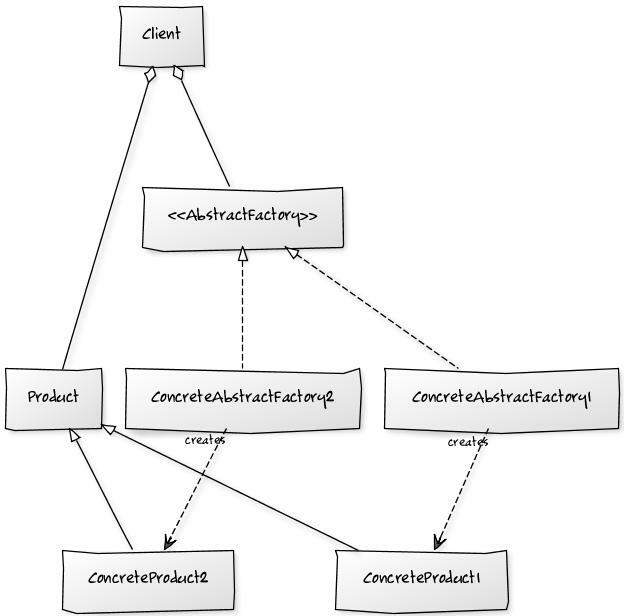 In this model, a generic interface of an abstract factory class is used to create the required concrete object separating the details of implementation of objects from their usage and composition. This design pattern is widely used in GUI applications where similar kind of GUI components needs to be created. Is Factory method more suitable for frameworks and Abstract facory for Library?